The original rocker profile makes for a surfy, playful ride, which is versatile and enhances performance. A medium to stiff flexing board for all mountain riding. Enjoy a powerful, stable ride, that can still be playful in the park. Ride regular, switch or upside down and you are in for a good time. This board has a set back stance, meaning it will power forwards, but can also be ridden switch with confidence. Like the flight core but even lighter! A combination of durable and lightweight woods create an unmatched strength to weight ratio. 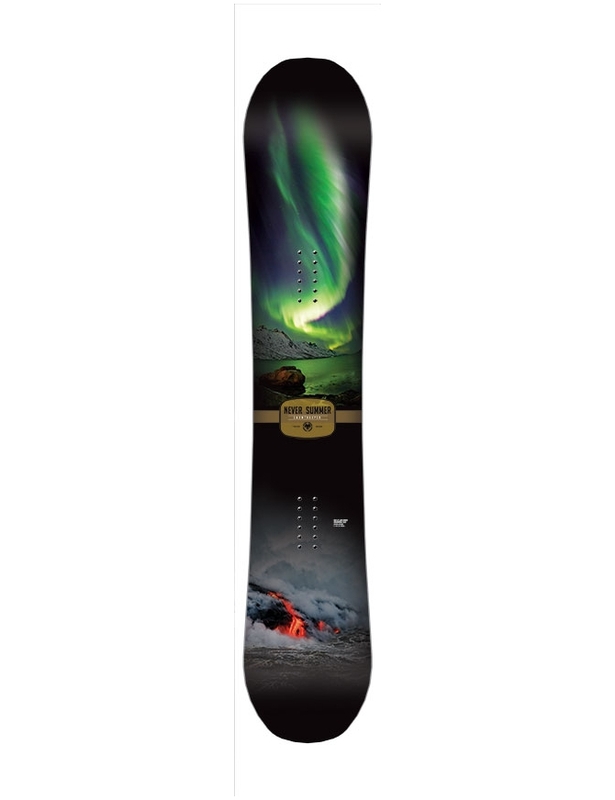 The worlds best snowboard fiberglass gives Never Summer boards their superior strength, edge hold and durability. Dampening along the edges, underfoot and at the tip and tail provide stability at high speeds, and absorb vibrations. Vario Power Grip side cut utilizes multiple edge contact points, allowing the board to track straight when required, while still providing maximum edge hold. An incredibly durable and scratch proof top sheet, which provides better grip than a gloss topsheet. Its basically like a giant stomp pad! Unmatched durability and speed. A top of the line snowboard base for riders at the top of their game. Carbon VXR Laminate Technology - With carbon "v" shapes that extend out from your inserts to the edges of the board, they add torsional strength to the board, and help give the board extra energy when loaded up to pop. STS Pre-tensioned Fiberglass - Pre-hardened, pre-tensioned laminate that has elastomer stringers - which means that the board have top notch strength, edge hold and performance. RDS 2 Damping System - Three narrower damping layers give you a good mix of vibration absorbtion and stability - the perfect mix for freestyle boards. Elastomeric Underfoot Stabilisers - Forget about understanding the name of this tech, all you need to know is that these are put under the inserts to provide optimum vibration absorption and increase stability at speed. Sintered P-Tex Sidewalls - Never Summer were the first to use P-Tex sidewalls, which can handle colder temperatures than standard ABS sidewalls. P-tex Tip/Tail Protection - The P-Tex protection seals and protects the wood core, as well as protecting it from vibrations and impacts.